Columbus has hosted over 270 new sporting events in the past 14 years and will welcome the NCAA Division I Women’s Volleyball Championship this December and the NCAA Women’s Final Four in 2018. These high-profile events mean Columbus and Central Ohio will see an increase in visitors from across the nation. As our reputation as a key destination for sporting events grows, and we experience growth of tourism in leisure, meetings, conventions and much more, transportation amenities and options are keeping pace. 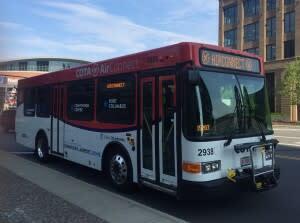 This month, the Central Ohio Transit Authority (COTA) introduced COTA AirConnect, offering direct bus service between downtown and Port Columbus International Airport. This convenient and economical service between downtown and the airport picks passengers up at Arrivals and drops them off at Departures. COTA AirConnect buses have luggage racks, USB charging ports, and convenient bus stops near downtown hotels and the Greater Columbus Convention Center. The service runs every 30 minutes (between 6 a.m. and 9 p.m.) and with only a $2.75 fare each way, COTA AirConnect saves visitors money and time. In addition to AirConnect, COTA’s CBUS® is a free downtown circulator that runs seven days a week connecting visitors to destinations throughout downtown, the Short North, the Arena District and the Brewery District. Columbus continues to create an efficient and stress-free travel experience for all visitors. COTA AirConnect and the CBUS add to the visitor experience as Columbus strives to become one of the world’s top destinations for sporting events. Visit the Experience Columbus Blog for more details on traveling with COTA AirConnect, and for more information on all COTA services, visit COTA.com.